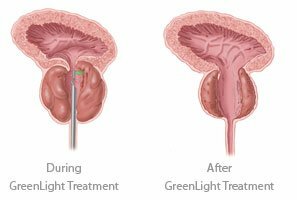 The GreenLight™ Laser Therapy is a treatment that combines the effectiveness of the traditional surgical procedure known as “Trans Urethral Resection of the Prostate” (TURP) with fewer side effects. GreenLight is suitable for most patients with an enlarged prostate. With over 375,000 patients treated, the GreenLight procedure is creating a new standard of care — a standard that offers freedom from enlarged prostate symptoms. Most patients return home a few short hours after the procedure and can return to normal, non-strenuous activities within days. The GreenLight laser system delivers the ultimate benign prostatic hyperplasia (BPH) solution — free from urinary symptoms, free from compromise, free to go! As with any medical procedure individual results will vary. The statements on this website are based on typical clinical study outcomes. Please consult your urologist for more detailed information and risks. Questions About BPH or GreenLight Laser Therapy? If you have questions about BPH or GreenLight Laser Therapy treatment, contact our adult urology experts at Advanced Urology Associates at 815.409.4930 or request an appointment.